Things are really getting going on Dexter this season. For those of you who don’t want to wait for Sunday to see some of what’s to come for our favorite masked monster, read on. Spoilers ahead! Showtime released a couple of video clips and the following episode description for Sunday night’s episode. Is it weird that I think the show is at its best when Dexter’s being backed into a corner? Maybe that’s why I’m getting so excited about the direction of this season. There are some really great subplots beginning to emerge. Here's Showtime's description for "First Blood." When Dexter is saddled with an unwanted conspirator, he is forced to make some hard decisions about her fate. Meanwhile, Dexter wonders if Rita's death has awakened a darkness inside Harrison. 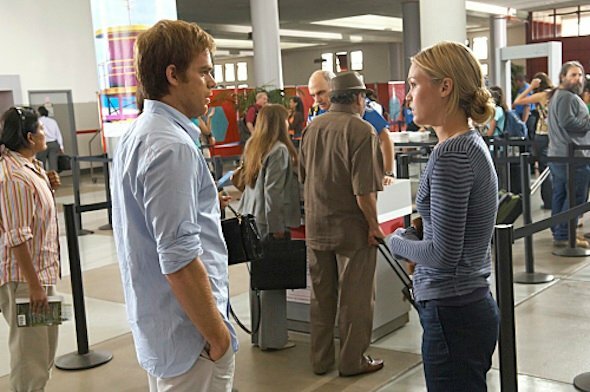 Due to Quinn's recent suspension, Debra works the Santa Muerte case alone, leaving Quinn time to enlist an old friend to look into Dexter. I’m curious to see if Dexter’s concern for Harrison, which has been addressed somewhat already this season, is due to something specific that happens (strange behavior that’s uncharacteristic for an adorable, dimply tot) or if it’s just more of Dexter’s fear. One problem to check off the list? So what are the other problems (that Dexter knows of)? Did he find out about Quinn’s investigation? Is he having more nanny-issues? Is Harrison showing signs of inner-darkness? As for Lumen, I don’t think Dexter will be getting rid of her so easily but from this photo, it does look like there’s an airport in her future. The fact that he didn’t have the slightest clue that they existed up until now is a bit alarming to say the least but then again, Dexter’s been a bit off his game so far this season. Dexter airs Sundays at 9:00 p.m. ET/PT on Showtime.